Advance screenings to the music documentary “Michael Jackson: This Is It” sold out within two hours early Sunday. Silly people (fans) began lining up three days ago and recieved all 3,000 tickets to the Los Angeles shows. The documentary opens nationwide Oct. 28, but fans will get a sneak peek the night BEFORE in screenings at the new Regal Cinemas Stadium 14. For the theater’s grand opening, the cinema will show “This Is It” on all 14 screens that night. 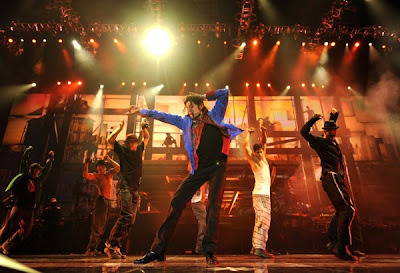 Directed by longtime Jackson collaborator Kenny Ortega, “This Is It” draws on hundreds of hours of footage as Jackson prepared for a series of London concerts for which he was rehearsing before his death on June 25.